"I wanted to say that the trip was incredible! I was absolutely blown away by the places we explored and by your company's professionalism. 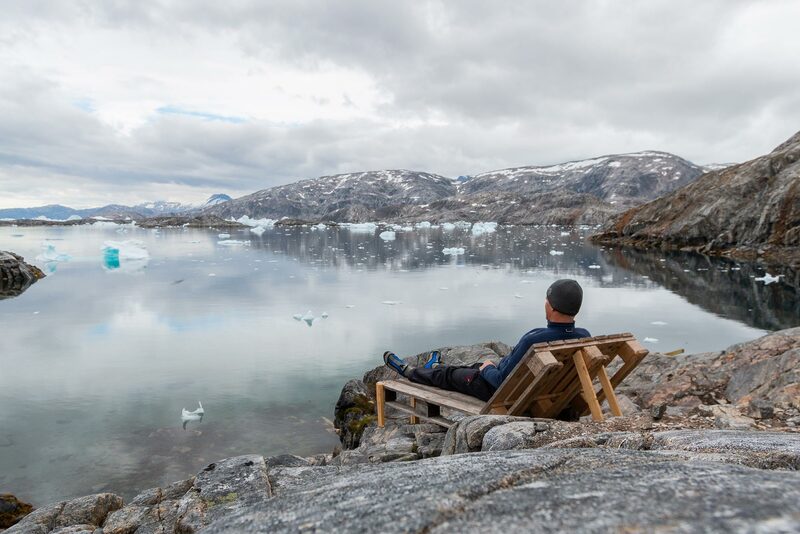 Our guide was constantly going the extra mile to see that we were all very happy and having the time of our lives out here in the beautiful wilds of Greenland. 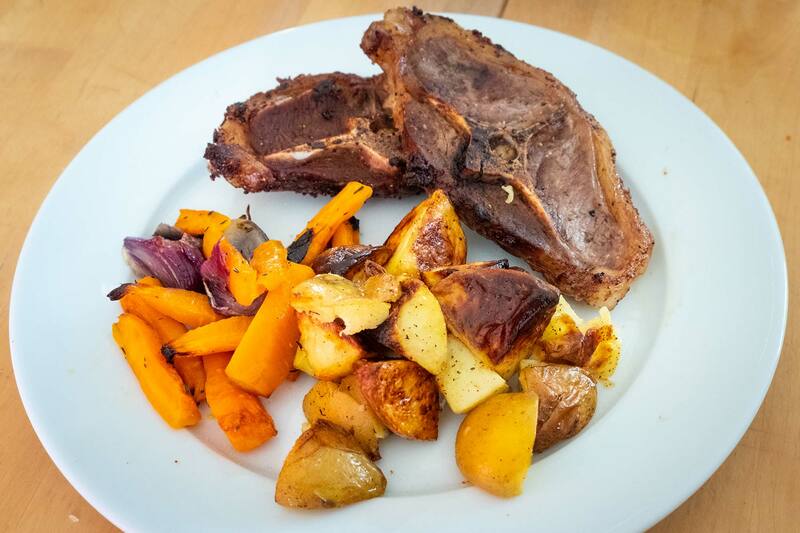 I will definitely tell all my friends and family about Icelandic Mountain Guides. This was one of the best weeks of my entire life." 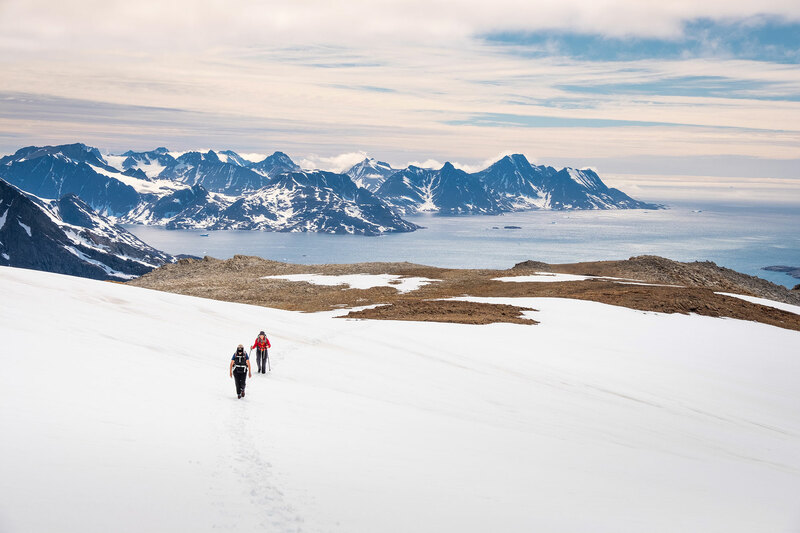 Between alpine like peaks and spires, surrounded by ocean that is frozen more than half of the year, lies one of the most isolated inhabited region of the planet. 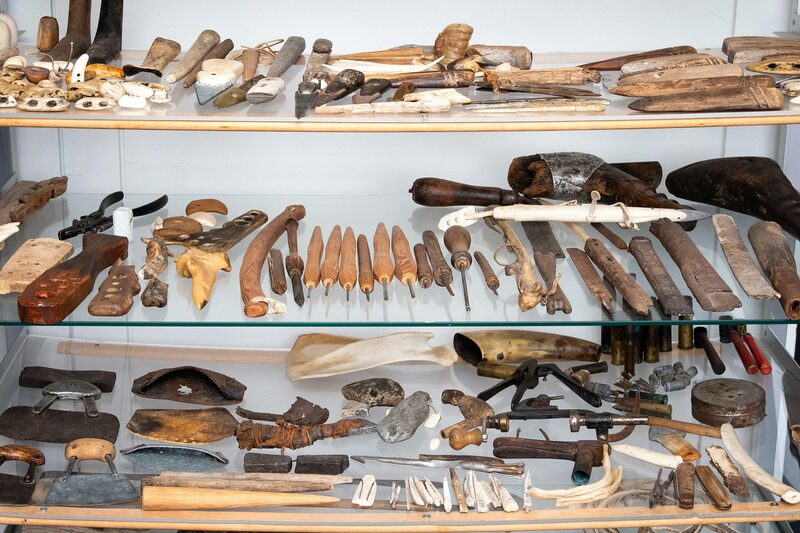 The people as they refer to themselves, survived through ages by seal hunting and fishing. These are the Inuit of the Ammassalik region. 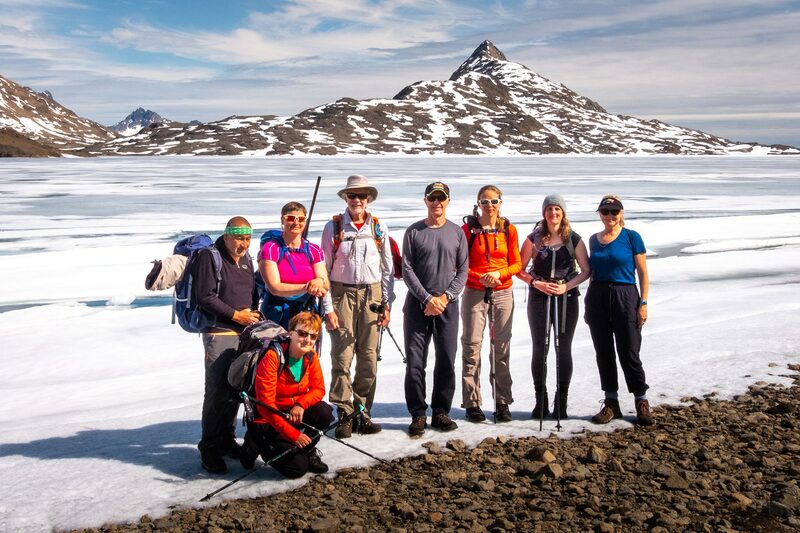 This fantastic trekking trip takes us to 3 of their highly isolated villages and to a mountain hut in the most incredible ice fjord. 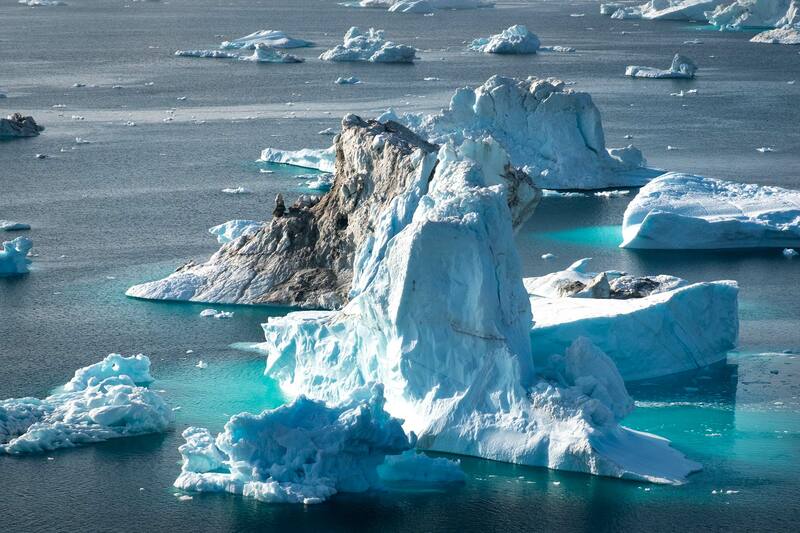 Mountains, icebergs, huge glaciers and rivers form the landscape. Add to that small colorful houses, friendly people, howling sled dogs, smiling kids and a pioneering spirit. This is an unforgettable tour for those who seek a different and unique experience and a true outdoor adventure, but prefer inside accommodation to camping in this wild and fascinating nature. 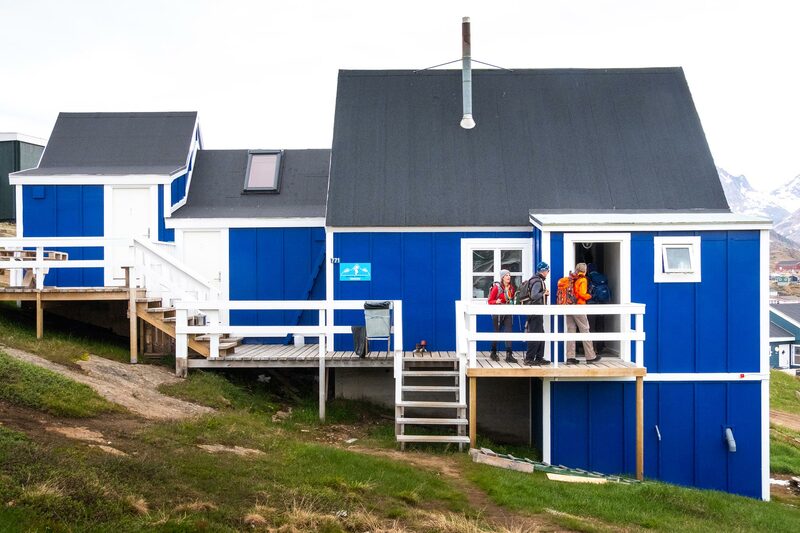 Included: Guide, food for 10 days (from lunch day 1 to lunch day 10), boat transfers, accommodation in basic hut/hostel/guesthouses plus two nights in cabins in the newly open Camp Qatoo at the Sermilik Icefjord. 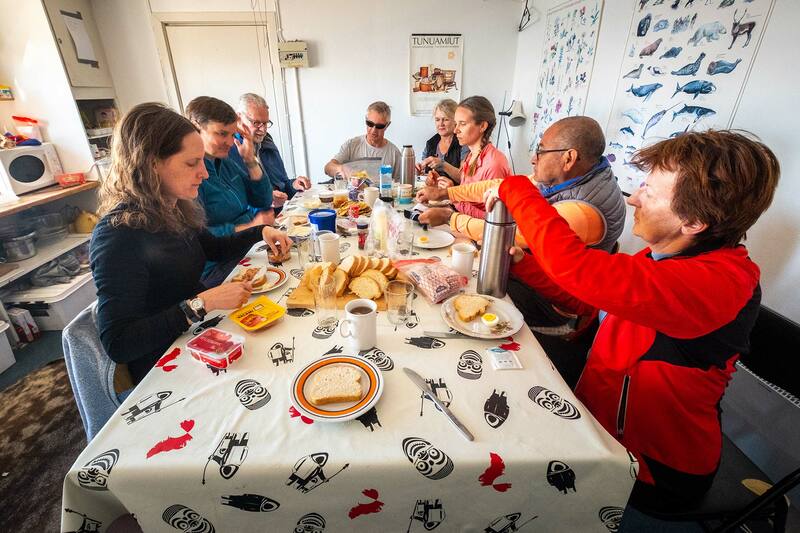 Not included: Flight from Reykjavík - Kulusuk - Reykjavik (can be added on the first and last day of the trip, please choose when booking), Personal equipment, insurance and expenses. A midday flight to Kulusuk or Kap Dan, "capital" of the island of Kulusuk and arrival at the same time: two hours flight and two hours time difference! 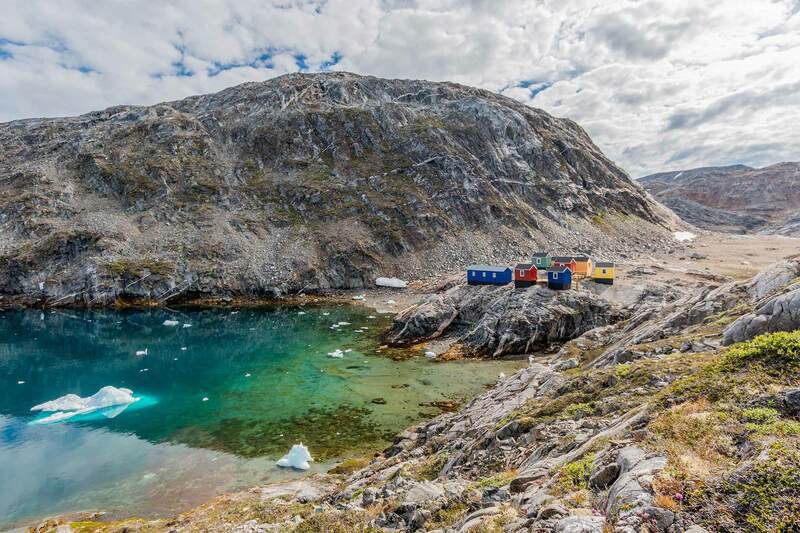 Kulusuk is actually a small village clinging to the rocky coast. In front of it the bay is littered with icebergs behind bold rocky peaks. And the local cemetery is a fascinating place! We explore the village and surroundings. Night at a hostel in Kulusuk. 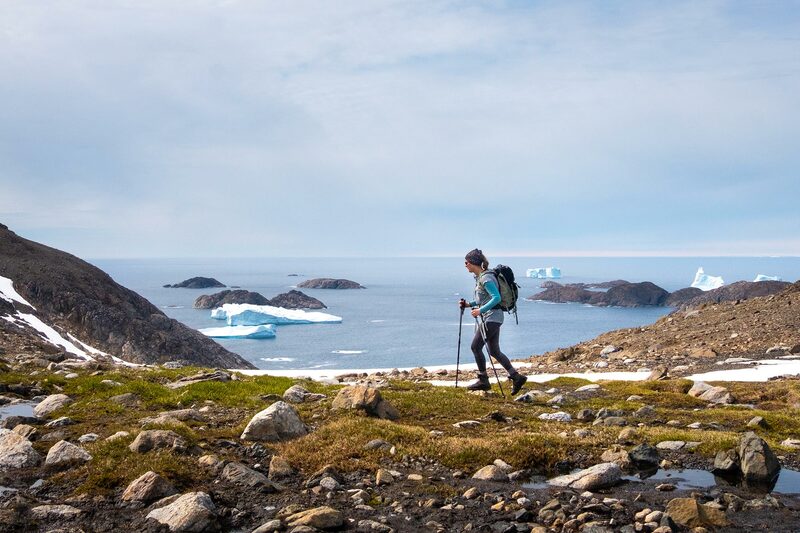 Having a whole day to explore the island of Kulusuk, we will take a walk that will give us insight into the local history and a chance to enjoy the amazing scenery. The view on the coast is amazing and at the most western tip of the island we see out to the Atlantic. Heading back we pass the lakes in the heart of the island. The Great Northern Loon, a bird that inhabits these parts will not be worried by our visit since it is really the best fisherman around! Following the road that leads through the island we arrive back to the village. Night at a hostel in Kulusuk. 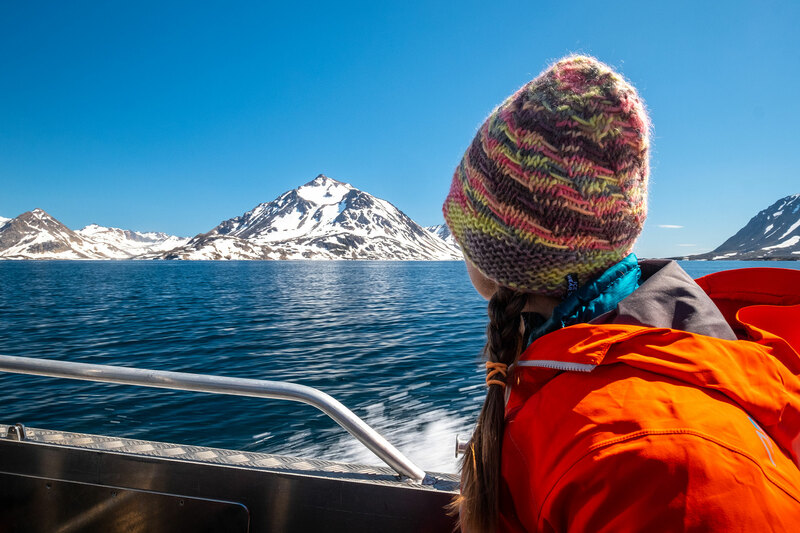 Transfer by boat to the interior of the immense Ammassalik Fjord, which extends more than 50 kilometers and twists and turns between the many cliffs and islands. 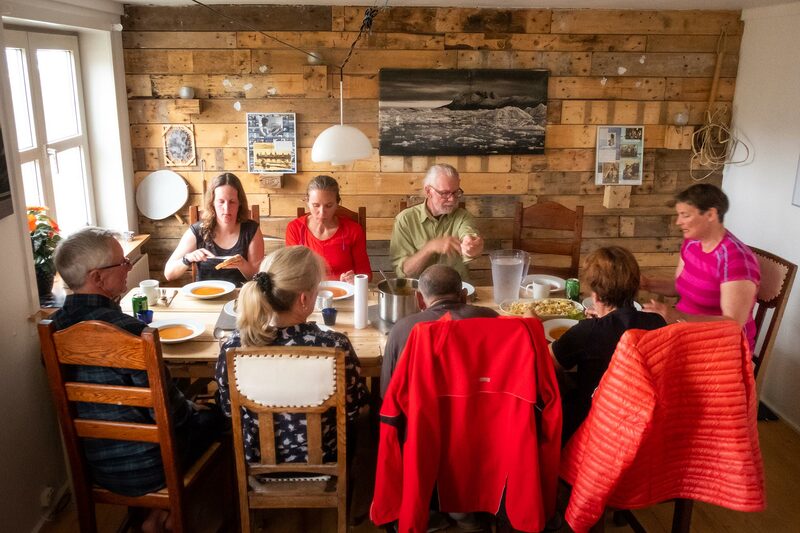 We reach the village of Kuummiut at situated at the end of a peninsula and there we settle down in a local house in the village. 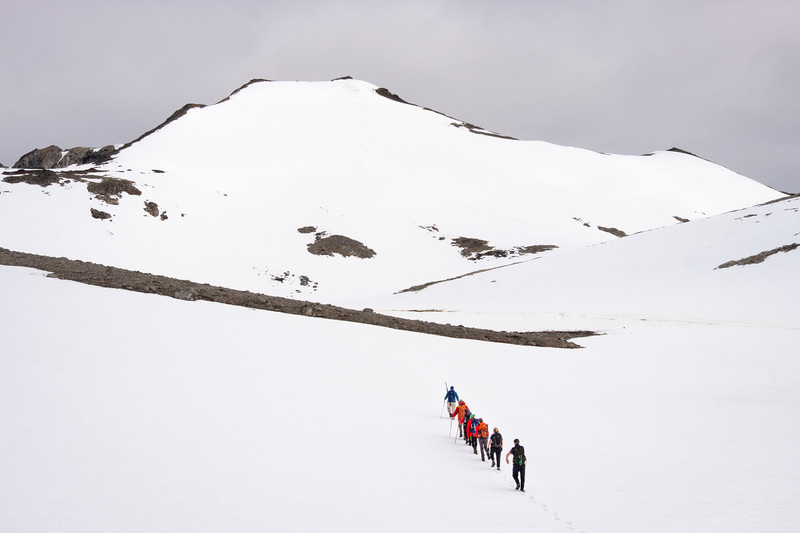 We start our walk to Illitsiartik in the fjord of Tunu (which means backside). 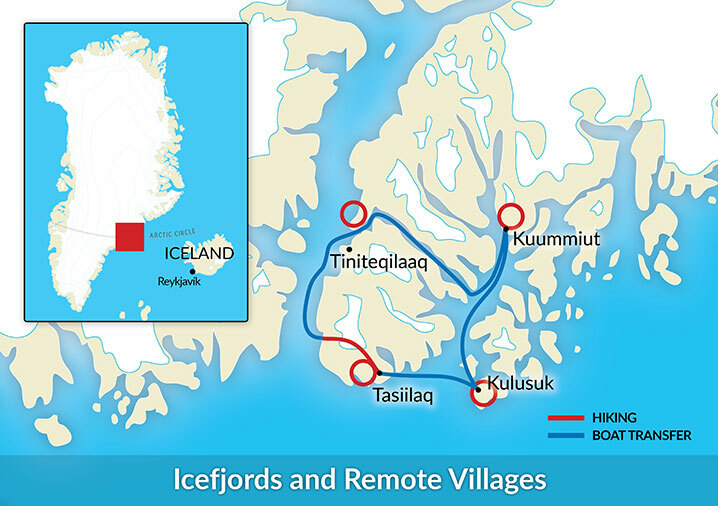 To enter the fjord, we head eastward through the Inuit village of Kuummiut. 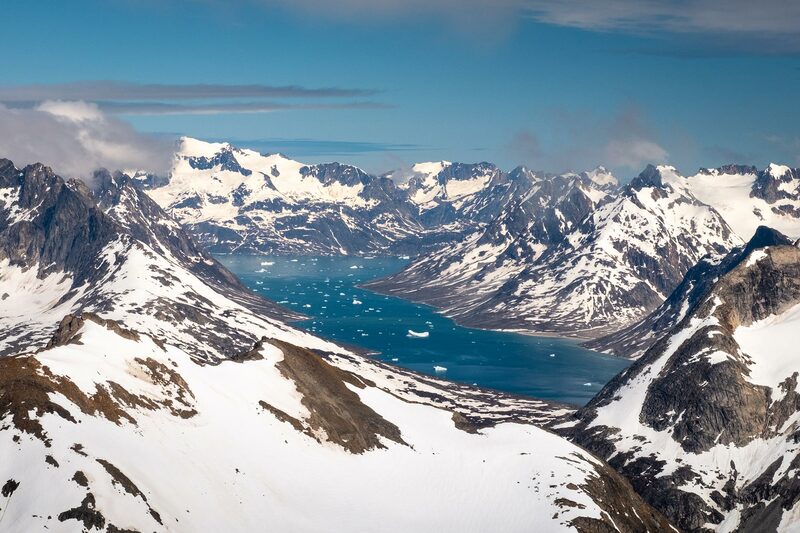 The terrain is relatively easy for Greenland, because we follow a flat strip of land wedged between the ocean and mountains, but we still have to a ford a river or two. 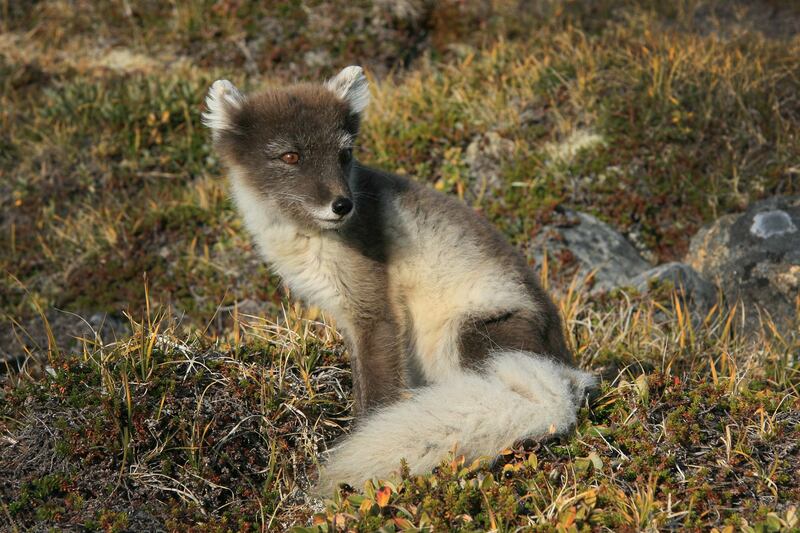 We enjoy the vegetation which is surprisingly rich considering how isolated Greenland is. We hike back after to our accommodation full of new impressions. Walking: 5-6 hours in total. 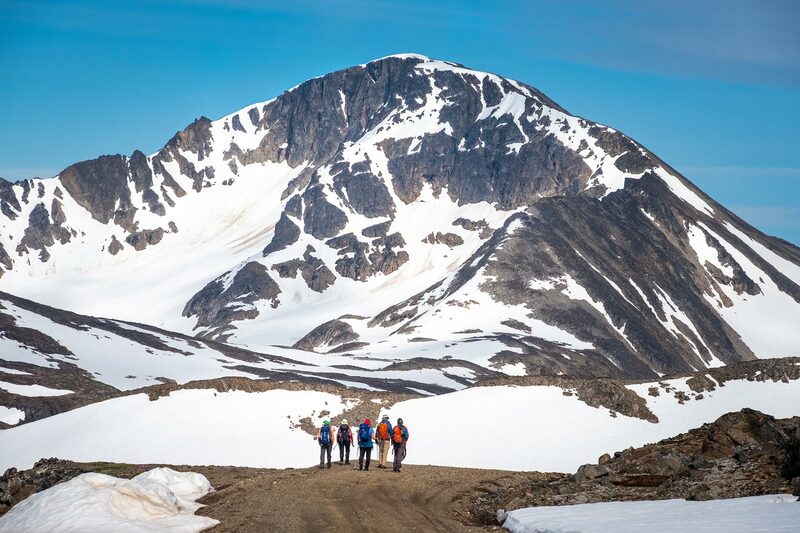 Today we climb Kuummiut Mountain that dominates the village. The altitude is modest, but we have to start from the sea level making this a good day’s hike. At the top an extraordinary view is waiting for us! To all directions we can see fjords, islands, mountains and glaciers. A perfect introduction to this world of rock, ice and water. Return to the same accommodation. 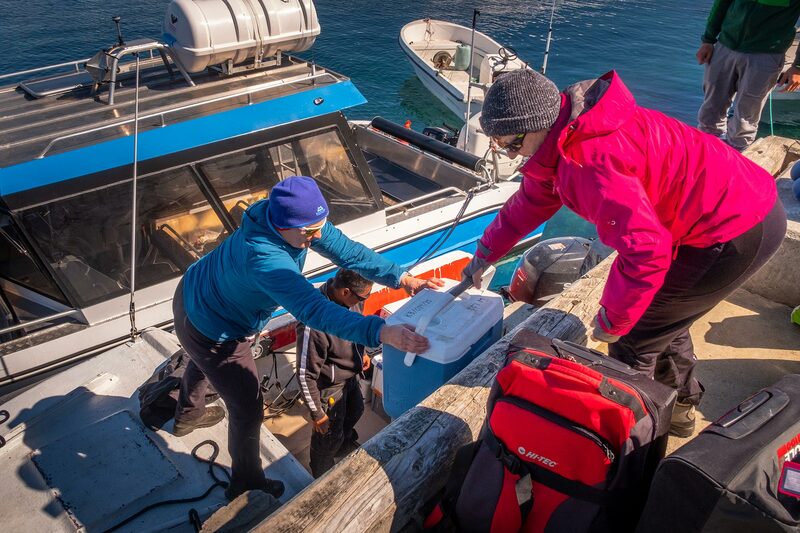 Today we leave Kuummiut and enjoy a boat trip between the icebergs through the Ammassalik Fjord, then a smaller sea street of Ikasartivaq before we reach another, smaller settlement of Tiniteqilaaq. 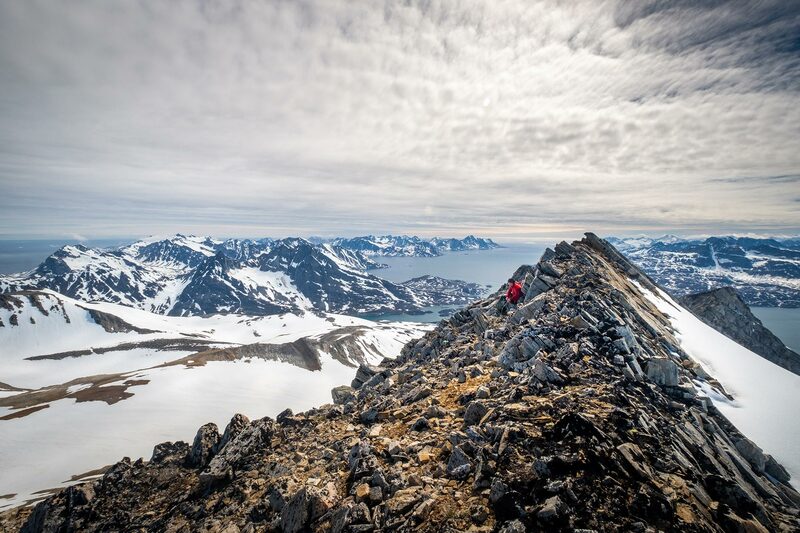 From here we will have an incredible view over Sermilik Icefjord. After the visit in the settlement, we continue to the beautiful Camp Qatoo where we stay for the next two nights. 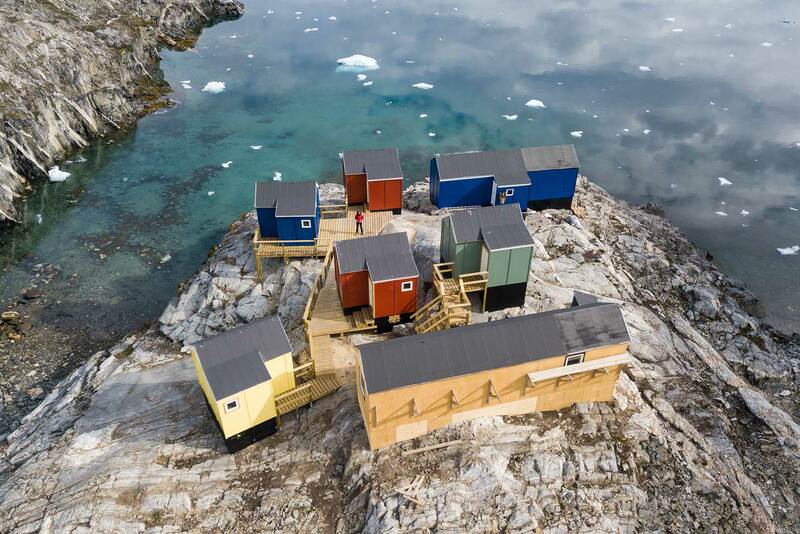 Camp Qatoo is a constellation of five small cabins and a collective cabin with a fully equipped kitchen, dining area and a lounge. Additionally there is a service cabin where we have access to a hot shower. 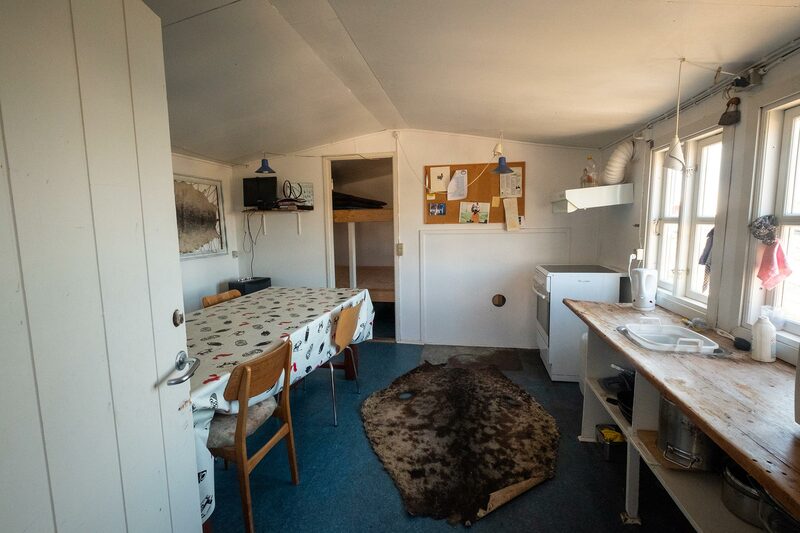 The cabins are rustic and cosy, and very comfortable. 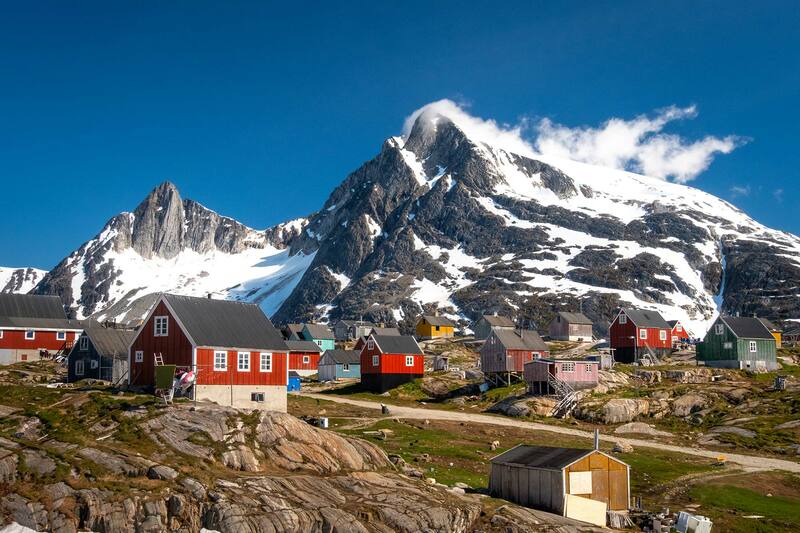 The camp is located by the marvelous Icefjord Sermilik and each cabin has an icefjord view. In the afternoon we explore the surroundings of the camp. Today we hike for an entire day in this remote area. 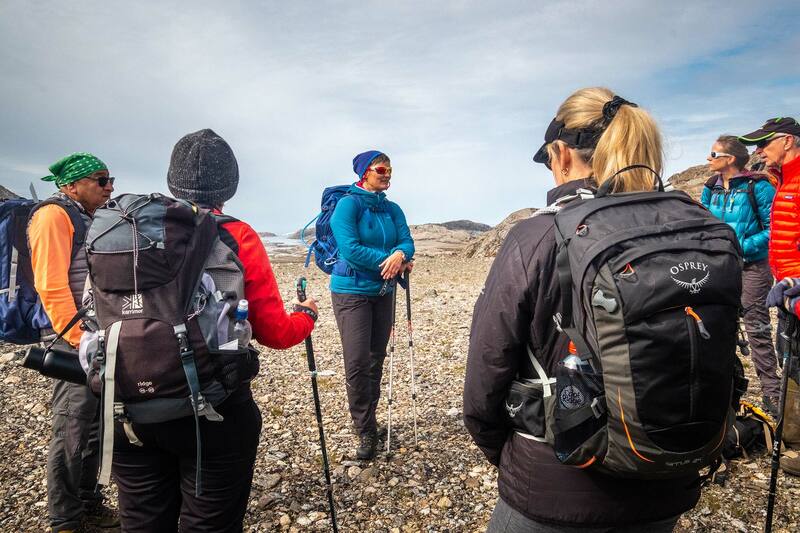 We hike along streams, over barren, rocky land always enjoying the fantastic views over the Sermilik icefjord with its icebergs. In good weather we can see the main ice cap which covers approx. 80% of Greenland. 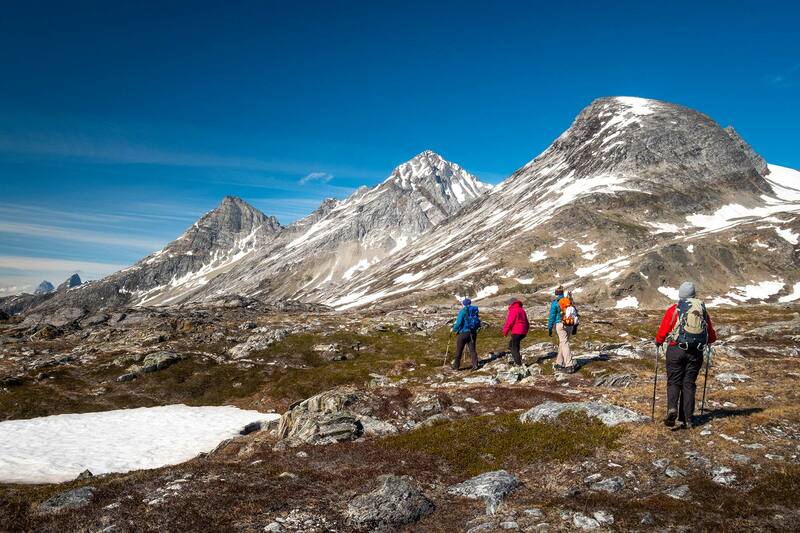 We see the traces of the glacier, pass small lakes and enjoy the wilderness and remoteness of this country. Night at Camp Qatoo. 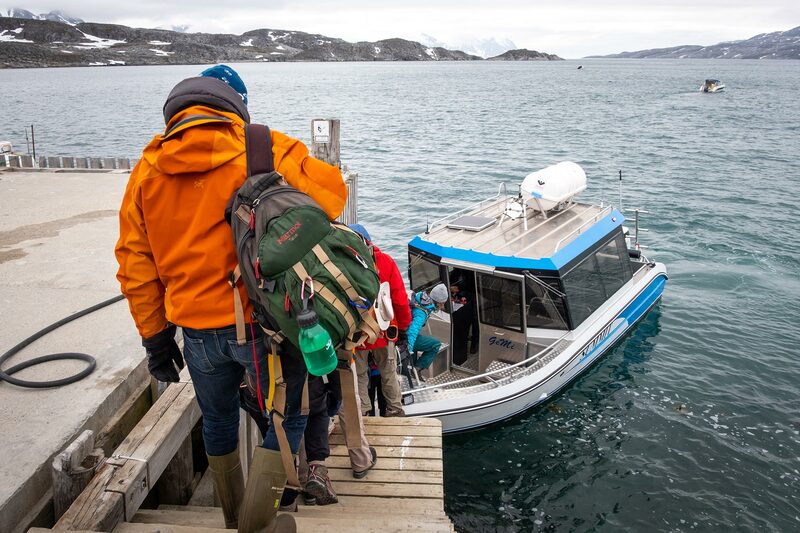 We start the day with a short boat transfer further south where we start our today´s hike. 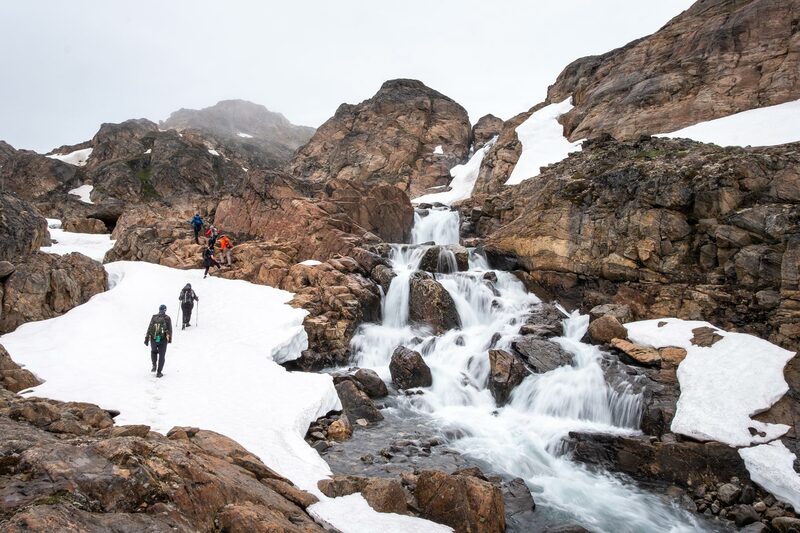 We hike along a stream and pass by a waterfall before we reach the pass of the Sermilik way. This route has been used for a long time by the locals. We descend on the other side and reach the lake 168. We hike along this bigger lake before we reach some smaller ones; finally, we arrive at the flower valley. It is lush with green and flowers, with butterflies fluttering by and a colourful cemetery with plastic flowers and white crosses. 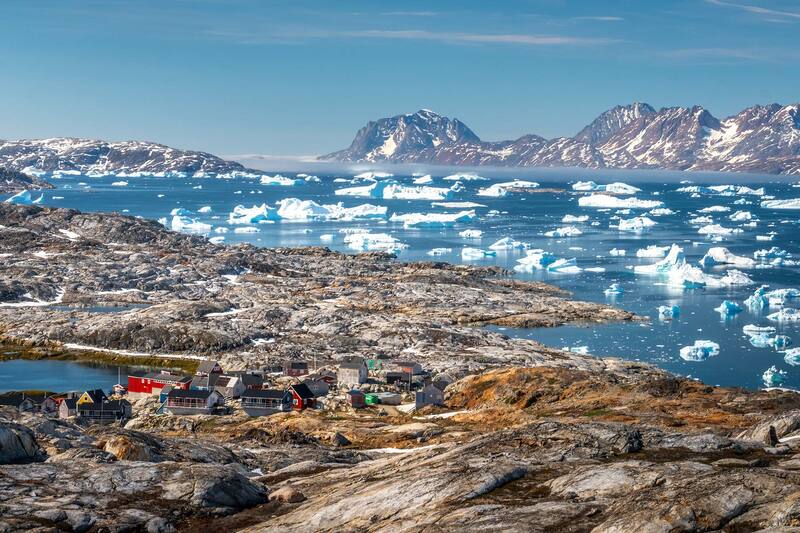 In the late afternoon we reach the biggest town of East Greenland, Tasiilaq with 1.800 habitants. Night in a guesthouse for the next 2 nights. Today the choice is yours. 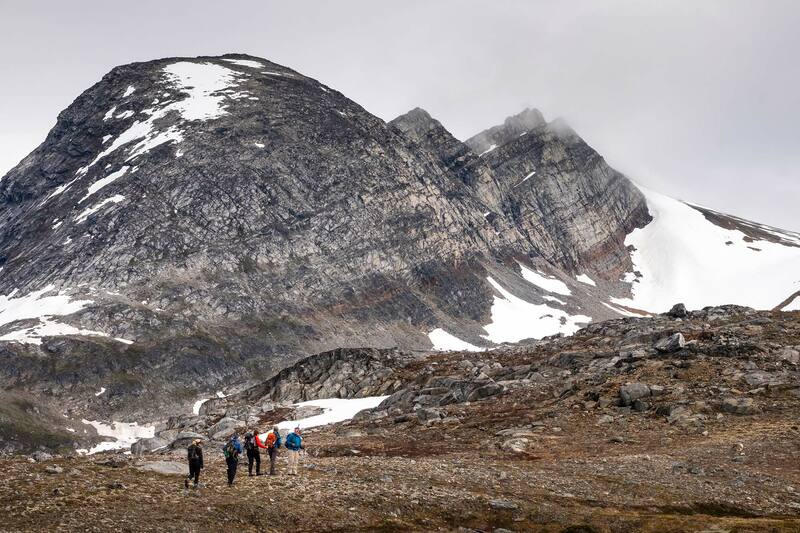 For those who want to go for a hike in the surroundings of Tasiilaq this will be an option. 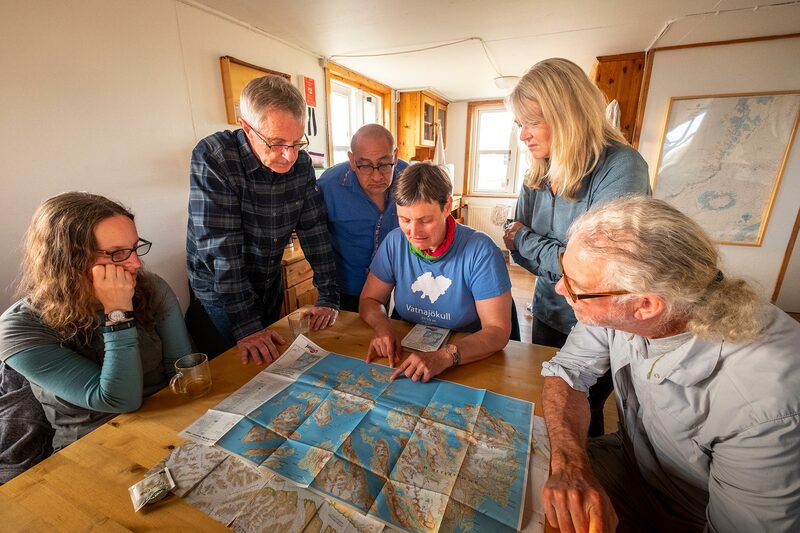 When back in Tasiilaq we can stroll around the town, possibly visit the local museum (depending on opening hours) or the local shop with artistic local products. A short walk in the morning before the boat transfer to Kulusuk Island and the return flight to Reykjavík. We need to confirm flight availability for this departure before we can proceed with your booking. Please contact us and we will get back to you about booking this tour.